With the ever growing problem with our school systems today, it's no question that the various techniques used in our schools could benefit from serious evaluation and change. While other industrialized countries are thriving, the United States continues to fall behind in performance, graduation rates and college attendance. Why, when everything else in our world seems to be progressing, is education treated so differently than other professions in our country? Could it be the lack of support for our teachers? Or the low standard of expectations of our students? What about the dwindling parental involvement? and Arin Lavinia discuss, through research, trial and error, how success can be obtained when schools shift their focus to improving the adults involved in education. Moskowitz's charter schools in Harlem have emerged as some of the top schools in New York City and she wants to share with all of us just how this came to be. Throughout the entire book, Moskowitz and Lavinia share various descriptions of how they keep students engaged and challenged, and their teachers informed, coached and supported. When teachers are supported with learning labs, coaching sessions, and rigorous curriculum, good things happen. Students are held to high standards, regardless of their background and parents are required to attend meetings and learning sessions and to fully support their child's educational needs. As a former teacher in a school full of disadvantaged and English as a second language learners, I fully appreciate the stress on high expectations. All students have the ability to learn and should be challenged. I just loved how the idea of clear, critical thinking is encouraged most of all. Students are challenged and encouraged to think for themselves and come up with their own ideas with the support of their teacher. The accompanying CD allows us to step inside any given classroom to observe the subtle ways in which lessons are tweaked to perfection. Let's be clear here, people. Moskowitz and Lavinia are not selling the charter school system. They are merely sharing with us, the very ideals that led to their success. I certainly think we as parents, teachers and administrators, can learn from these leaders. Enter to win a copy of your own right here! Comment below for a chance to win Mission Possible: How the Secrets of the Success Academies can work in any school, by Eva Moskowitz and Arin Lavinia that includes a companion DVD, providing clips and interviews. One luck winner will be selected by betterwithabook.com. US residents only. 1. Please leave a comment below by August 17th, 2012. 2. 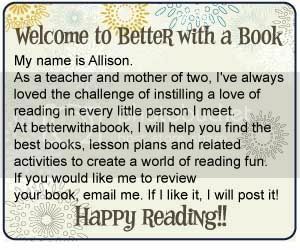 You can also like Betterwithabook on Facebook and leave a comment here telling me you liked our page. 4. Daily comments are allowed for additional entries. Good luck! Disclosure: I was compensated for this post. As always, all thoughts and opinions expressed are my own. I would love to see how this could work in my own new teaching venture. I could really use this book in my classroom! This looks like a wonderful resource book for teachers and parents! This is awesome for teachers! This is a great prep tool since the beginning of school is right around the corner! I could use this book preparing for the fast approaching school year as a teacher and as a parent! The book sounds very positive and encouraging for all learners! Thanks for the chance to win! I'm sure the book is full of great ideas! I have several friends who are teachers, and am always interested in helping them to find new ways to reach our children. This is very interesting to me, and I'm sure it will be to them, too! Can't wait to read this book! Thanks for the opportunity to win this. I would like to read this in regard to my nieces.